Reece, (my partner in colour) and Mateo took me along to the Sydney Design and Decorate show this week. It was exciting to see the decorating trends with all the gorgeous fabrications, shapes and themes.﻿ The only thing missing was a quilt. Not one anywhere. Hmm. Then I spotted these chairs.which were my favourite thing! OMG! (to coin a phrase) I love these chairs!!!! Patched together dramatic random fabrics, textures and characters including The Madonna, my favourite theme...she is the female voice of hope and serenity...promise and joy..the inner pease and strength of women with so much TO DO. Here is the designer, Ellis Lee of Independent Label. He excitedly told me about his design concept which is to mix the traditional shape of the wing back chair with a mixture of new hip fabrics randomly pieced together to create a new look. He was very earnest about this "new" concept so I had to hold back my urge to scream, YEAH, I GET THAT!!!!! Very smart chair and just the kind of accent one needs to make the house come to life. However, the price was a bit much for the likes of my budget. I said to Reece I might sell my car and buy one but he said my car wouldn't bring enough money. True. Darn. Anyway they are divine in more ways than one. The other day it was hot. So hot that Cheeky actually got in the pool and stayed there enjoying the relief of the cool water. This was a big step for her and a sign that she is actually trusting us. Persistence continues to pay off with her. However, she was still keen to resume the manic ball control thing as soon as she got out. It was a step in the right direction and then the known, familiar behaviour returned. I really wish I knew what she was thinking while doing this. The patience required to hold that ball absolutely still is beyond me. What the heck is that? I read a nice poem once that said sanity is not about being calm in a place where there is no noise or distraction but to be in the midst of choas and remain calm. Something like that although a bit more poetic. Inner peace. I seek it but find my inner parts more chaotic than my surroundings. This year I am really trying to wrestle the chaos to the ground and to achieve inner peace. Help me here I am struggling. Did I say that out loud? I remember the days when it was the kids that caused the chaos. Check out this little man in front of my Dream Catcher quilt! Fully in control of that putter and conducting the audience...fully in control while looking as handsome as can be! This is Andrew, the son of Clare Mooney, editor of Quilters Companion. There is a lot in this photo. Firstly he looks so in control of himself and gorgeous against the colourful backdrop. But what about the mom? How does one struggle a big job like a magazine with such a sweet distraction? Take a deep breath and manage the chaos caused by interuptions that will one day be a memory. 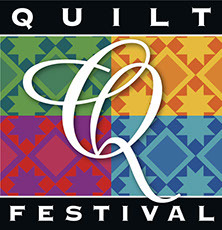 AND...quilters...Attention please! Yesterday Brigitte Giblin started back at the shop with our first class of 2012! 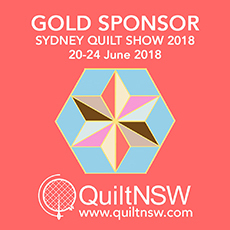 Her suitcase arrives stuffed with beautiful quilts made artfully with beautiful combinations of fabric and bringing to life traditional English and Australian vintage quilt designs..
Brigitte is extremely skillful when it comes to making quilts. Her eye for colour is subtle and yet very alive. The use of patten is exciting as well. There might have been some people that arrived with an idea of what to do but I am sure this caught their eye and they were distracted immediately from their own goal! Hard not to be. Resist the temptation of this? Not bloody likely. 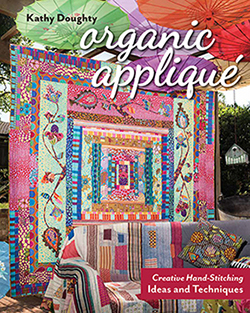 Brigitte and I are sharing the experience of publishing books with Quilt Mania. Which by the way is now available at the shop!!!! This month's issue features The Secret Sewing Sisters from Melbourne so it is a guaranteed excellent read! The chair defintely makes a statement!! France in April? That should be a load of fun!! Absolutely! Put me on the list for yours. Love the chairs! You could always respond to Reece with, "the chair will increase in value, especially if the artist becomes famous, and the car won't"
As far as finding peace, sometime letting go of controlling chaos you can find peace. I find that trying to keep a lid on the chaos of my three little kids is more exhausting than letting it whiz by. I've already emailed you to go on the list for your book. I hope your Dreamcatcher is in it? It's stunning - and manages to hold its own even with that gorgeous little distraction taking the foreground! Please add me to the Brigitte Giblin list too. Hi Kathy, please add me to the list for both books - thanks. Those chairs are to die for! I would love to try something like that with a thrift store or yard sale find and some Alexander Henry fabric...hmmm. Hi Kathy, May I please join the growing list for copies of both books? The chairs are fabulous! I do admire your self control regarding the 'newness' of the concept. Such a strength must lead down the "inner peace" path somehow, don't you think? Regards, Deborah. Looking forward to seeing you on Saturday at the Guild meeting. I just think of Parisienne Chic! 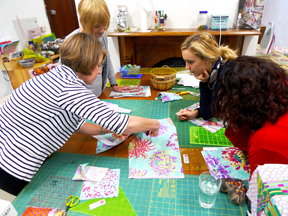 I loved your talk and seeing photos of your quilts amongst the Aussie landscape was such beauty.